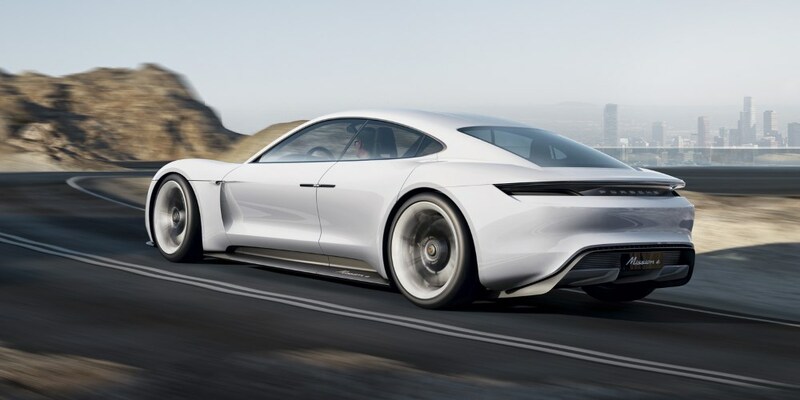 Porsche is introducing the first all-electrically powered four-seat sports car in the brands history. A concept that combines emotional design with excellent performance. Key specification data of this fascinating sports car: four doors and four single seats, over 600 hp (440 kW) system power and over 500 km driving range. All-wheel drive and all-wheel steering, zero to 100 km/h acceleration in under 3.5 seconds and a charging time of around 15 minutes to reach an 80 per cent charge of electrical energy. Instruments are intuitively operated by eye-tracking and gesture control, some even via holograms - highly oriented toward the driver by automatically adjusting the displays to the driver's position. 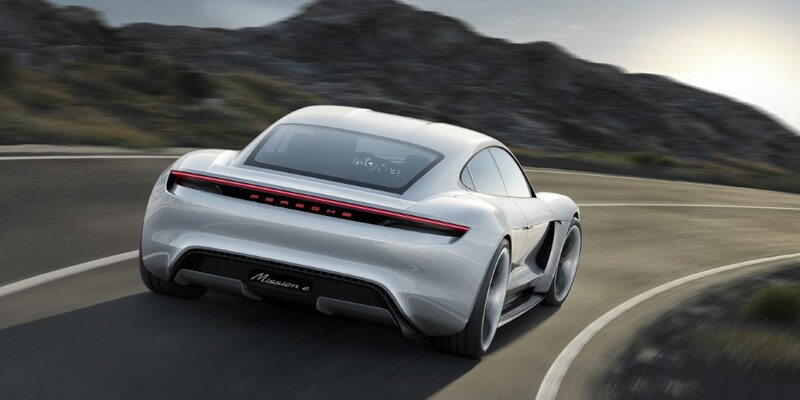 The drive system of the Mission E is entirely new, yet it is typical Porsche, i.e. proven in motor racing. Two permanent magnet synchronous motors (PMSM) - similar to those used in this year's Le Mans victor, the 919 hybrid - accelerate the sports car and recover braking energy. The best proof of a Porsche is 24 hours of top racing performance and a 1-2 finish. Together the two motors produce over 600 hp, and they propel the Mission E to a speed of 100 km/h in less than 3.5 seconds and to 200 km/h in under twelve seconds. In addition to their high efficiency, power density and uniform power development, they offer another advantage: unlike today's electric drive systems, they can develop their full power even after multiple accelerations at short intervals. The need-based all-wheel drive system with Porsche Torque Vectoring - which automatically distributes torque to the individual wheels - transfers the drive system's power to the road, and all-wheel steering gives precise, sporty steering in the desired direction. This makes the Mission E fit for the circuit race track; its lap time on the Nürburgring Nordschleife is under the eight-minute mark. It is not just passionate sportiness that makes up a Porsche but also a high level of everyday practicality. 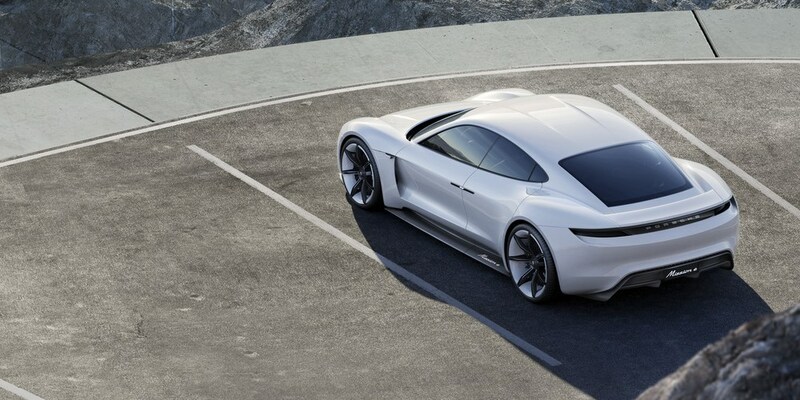 Accordingly, the Mission E can travel over 500 km on one battery charge, and it can be charged with enough energy for around 400 km more driving range in about fifteen minutes. 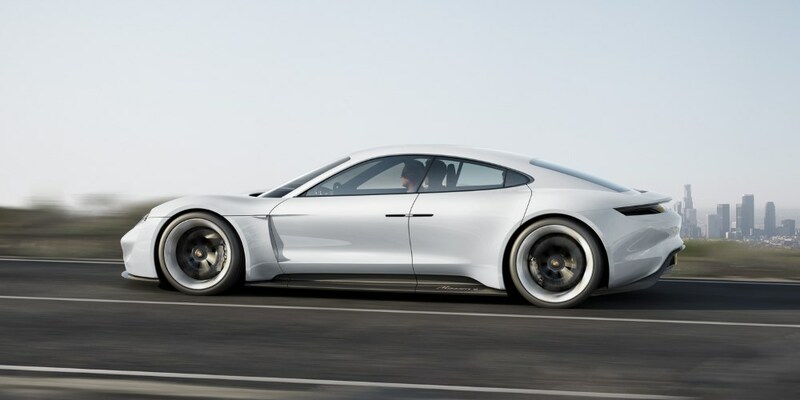 The reason: Porsche is a front-runner in introducing innovative 800-volt technology for the first time. Doubling the voltage - compared to today's electric vehicles that operate at 400 volts - offers multiple advantages: shorter charging times and lower weight, because lighter, smaller gage copper cables are sufficient for energy transport. A moveable body segment on the front left wing in front of the driver's door gives access to the charging port for the innovative “Porsche Turbo Charging” system. Via the 800-volt port, the battery can be charged to approximately 80 per cent of its capacity in around 15 minutes - a record time for electric vehicles. As an alternative, the technology platform can be connected to a conventional 400-volt charging station, or it can be replenished at home in the garage via convenient inductive charging by simply parking over a coil embedded in the floor of the garage from which the energy is transferred without cables to a coil on the car's underbody. Every square inch, every angle, every radius of the Mission E reflects one thing above all else: emotional sportiness in the best tradition of Porsche design. The starting point is the sculpture of a sport saloon with a low height of 130 cm with sports car attributes from Zuffenhausen that embodies visible innovations such as its integrated aerodynamics. Distinctive air inlets and outlets - on the front, sides and at the rear - typify the body's full flow-through design that enhances efficiency and performance. Integrated air guides improve airflow around the wheels, for instance, and air outlets on the sides reduce overpressure in the wheel wells, thereby reducing lift. The much reduced sculpting of the front end shows a classic Porsche sweepback, and it relates the concept car to the 918 Spyder and Porsche race cars. A new type of matrix LED headlights in the brand's typical four-point light design captures the viewer's gaze. 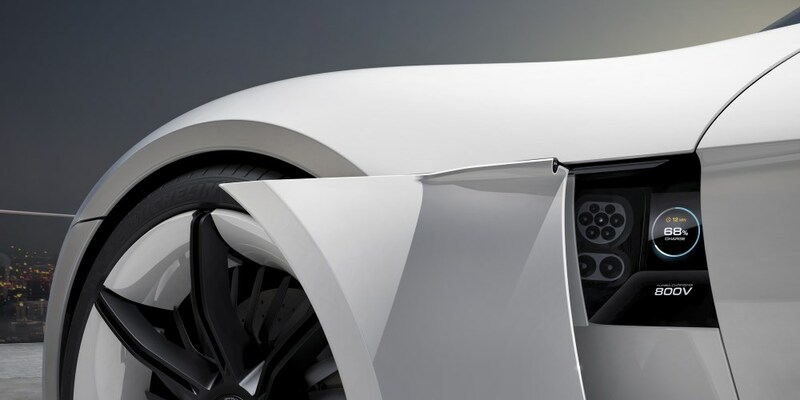 Integrated as an element hovering in the airflow of the air inlet, they lend a futuristic character to the front end. The four LED units are grouped around a flat sensor for assistance systems whose border serves as an indicator light. Distinctive front wings and an extremely low-cut bonnet reference 911 design. As in the 911 GT3 RS, a wide characteristic recess extends from the overlapping front luggage compartment lid up and over the roof. The line of the side windows is also similar to that of the 911, however, with one important difference: two counter-opening doors enable convenient entry - without a B-pillar. Another difference: instead of the classic door mirror, inconspicuous cameras are mounted on the sides that contribute to the car's exceptional aerodynamics. 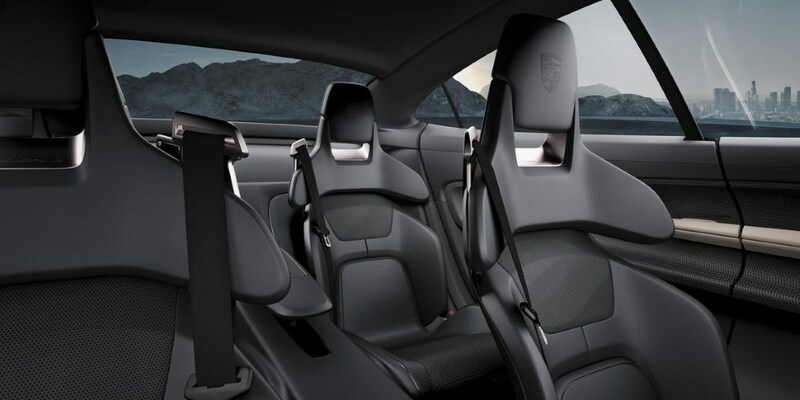 The interior of the Mission E transfers all of the traditional Porsche design principles into the future: openness, purist design, clean architecture, driver orientation and everyday practicality. The all-electric drive concept made it possible to fully reinterpret the interior. The lack of a transmission tunnel, for instance, opens up space and gives a lighter and more airy atmosphere to the entire interior. Race bucket seats served as inspiration for the four single seats. Their lightweight design is weight-saving, and it gives occupants secure lateral support during dynamic driving. Between the front seats, the centre console - elegantly curved like a bridge with open space beneath it - extends up to the dashboard. 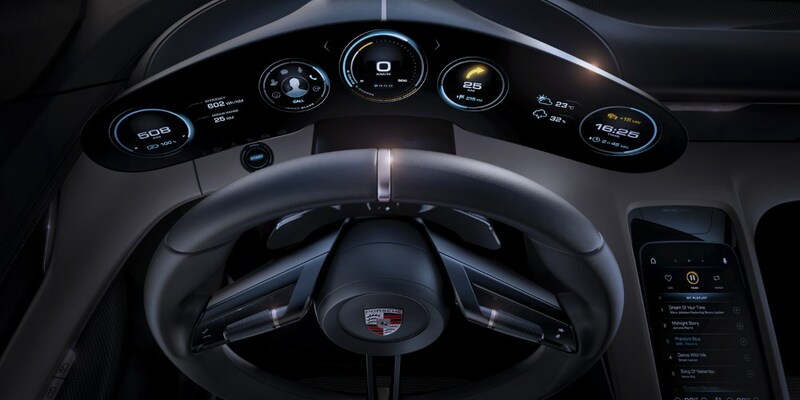 A new world based on an innovative display and control concept opens up before the driver. It is intuitive, fast and free of distractions - created for the sports car of tomorrow. The filigree driver's display is curved, low-profile and free-standing. 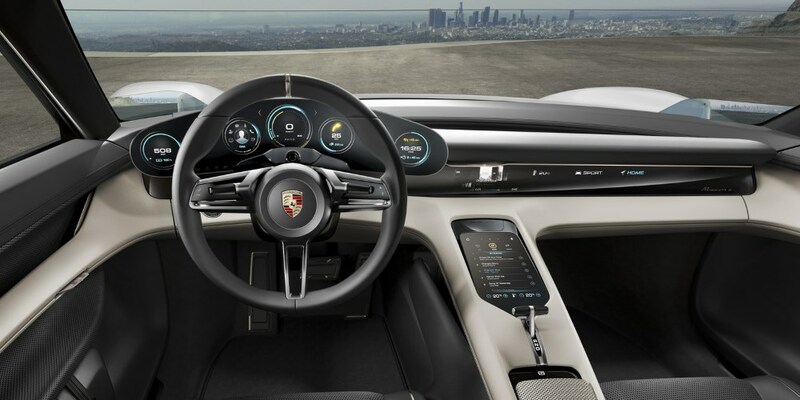 The instrument cluster shows five round instruments - they can be recognized as Porsche, but they are displayed virtually in OLED technology, i.e. by organic light-emitting diodes. The round instruments are organized according to the driver-relevant themes of Connected Car, Performance, Drive, Energy and Sport Chrono. The controls are just as innovative. An eye-tracking system detects, via camera, which instrument the driver is viewing. The driver can then activate the menu of the instrument in focus by pushing a button on the steering wheel and navigate in it - which also involves an interplay of eye-tracking and manual activation. But that is not all: the display follows the seat position and body attitude of the driver in what is known as a parallax effect. If the driver sits lower, higher or leans to one side, the 3D display of the round instruments reacts and moves with the driver. This eliminates situations in which the steering wheel blocks the driver's view of certain key information, for instance. All relevant information such as vehicle speed is always within the driver's line of sight. The entire dashboard is chock full of new ideas. Its division into two three-dimensionally structuring layers reinforces the impression of lightness and clarity. The upper layer integrates the driver's display, and between the levels there is a holographic display that extends far into the passenger's side. It shows individually selectable apps, which are stacked in virtual space and arranged by priority with a three-dimensional effect. The driver - or passenger - can use these apps to touch-free control primary functions such as media, navigation, climate control, contacts and vehicle. The desired symbol is activated by gestures that are detected by sensors. A grasping gesture means select, while pulling means control. Moreover, driver or passenger can use a touch display on the centre console to control secondary functions such as detailed information menus.